El colibrí colihabano o chupasavia (Boissonneaua flavescens) es una especie de ave perteneciente a la familia Trochilidae (Colibríes), que se encuentra en Colombia, Ecuador y Venezuela. 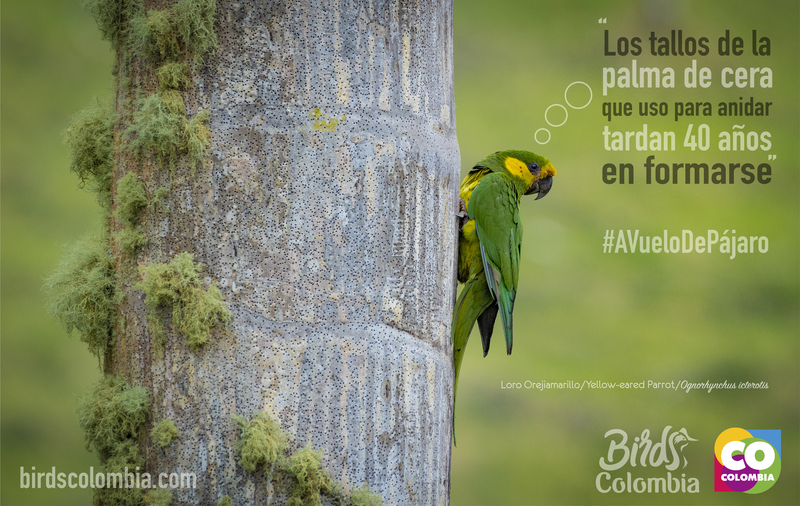 B. f lavescens flavescens (Loddiges, 1832) – Andes occidentales en Venezuela y en Colombia en las tres cordilleras. En los bordes del bosque húmedo de montaña, robledales, bosques de niebla y áreas secundarias entre los 850 y 2.800 m de altitud, preferentemente por encima de 1.400 msnm. Machos Largo del pico: 21.1 ± 0.8 ; Largo del Ala: 76.3 ± 2.2; Largo rectriz 1: 39.5 ± 1.5; Rectriz 5: Hembras Largo del Pico: 20.9 ± 0.9; Largo del Ala: 71.6 ± 2.0; Largo rectriz 1: 39.3 ± 1.6 ; Largo de la rectriz 5: 46.2 ± 1.6. (Datos tomados del trabajo Biogeografía del genero Boissoneaua, Ornitologia neotropical). Peso: Promedio para ambos sexos 8.0 gramos. El plumaje del dorso y el pecho es verde brillante, que se hace resplandeciente en la corona y la garganta. El vientre es amarillento con discos verdes. En las alas las primarias son negruzcas. Bajo las coberteras de las alas el color es ante acanelado; las plumas del centro de la cola bronceadas y el resto de la cola color crema con puntas bronceadas. El macho realiza una vocalización, que es un repetitivo chip. Generalmente este llamado es usado cuando el colibrí está posado en espacios abiertos de la subcanopia, a una distancia adecuada de otros colibríes, pero también se ha registrado en los alimentadores cuando hay presencia de múltiples colibríes. Se alimenta de néctar e insectos. Se aferra a las flores y coloca las alas en V cuando se alimenta, dejando por instantes de aletear. Sus principales recursos florales son: Besleria quadrangulata (Gesneriaceae); Palicourea sp. (Rubiaceae); Palicourea killipii (Rubiaceae); Pitcairnia lehmannii (Bromeliaceae) y Clusia sp. ( Clusiaceae). The buff-tailed coronet (Boissonneaua flavescens) is a species of hummingbird from the family Trochilidae. It is found in Colombia, Ecuador, and Venezuela. Distinguishing characteristics are the short bill, glittering green coloration, and buffy color under the remiges (flight feathers) and rectrices (tail feathers). Like other hummingbirds, the buff-tailed coronet is often found in mid-level forest to canopy searching for flowers with nectar and some insects. This bird is commonly found from 1500–2400 meters above sea level. The buff-tailed coronet has only slight sexual dimorphism. The female is scaled with white feathers mostly throughout the chin and throat, and some on the belly. Prominent feather colorations are iridescent green with darker wing tips, and buffy hues under the wing and tail feathers. On the face, there is an obvious white post ocular spot on each side. Puffy white “boots” are present at the thighs, an orange tuft at the shoulder, and a short, dark bill. Average size for a buff-tailed coronet is 13.2-13.5 cm with a bill length of 1.8–2 cm. The buff-tailed coronet and fawn-breasted brilliant (Heliodoxa rubinoides) are commonly confused due to their similar posterior coloration. The fawn-breasted brilliant has more buff coloration on its breast and underbelly. The vocalization of the male buff-tailed coronet is a repetitive “chip” noise. This song is usually used when the bird is perched in open areas of the sub-canopy, being within suitable distance from other hummingbirds. The song has also been recorded at feeders with multiple hummingbirds present. The bird occupies many types of habitat, including cloud forest, elfin forest, and páramo. It occurs at 1500 to 2400 meters in elevation. The buff-tailed coronet may share feeding areas with other hummingbirds, but it can be aggressive.